The new factory-fit multi pallet handler attachment helps customers boost productivity by handling one or two pallets, side by side, up to a maximum load capacity of 3,200kg. 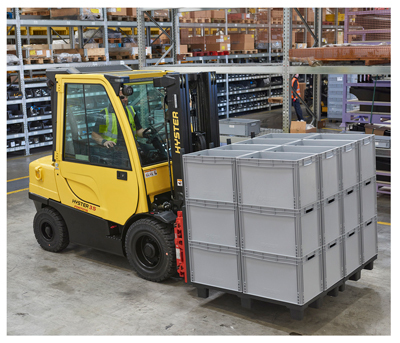 Depending on the needs of the application, UK/CHEP or EURO pallet options are available on selected new Hyster electric and IC 2 to 4.5 tonne lift trucks. “The Autospeed Hydraulics feature on the Hyster FT forklifts also gives the driver the power needed for hydraulic work without the need to press the accelerator and use an inching pedal, making working with attachments more comfortable and productive,” continued Hardy. To turn loads upside down, Hyster Europe is now also offering a factory-fit 360° rotator attachment for use with selected new 2 to 3.5 tonne lift capacity trucks from both electric and IC series. The rotators can empty containers or boxes and can be useful in applications where the working cycles require partial or full load rotation. The 360° rotator attachments are typically used in metallurgical, foundry and chemical applications as well as automotive, paper, waste management and food processing operations, including fishery and agriculture. There are four different models available offering a wide range of capacities and options to suit the application, and particular foundry and fishery versions can be specially engineered on request. “To help maximise uptime, applications using the new factory-fit programme will be supported by their local Hyster distribution partner, whose engineers are trained to provide full servicing for the attachment,” concluded Hardy.